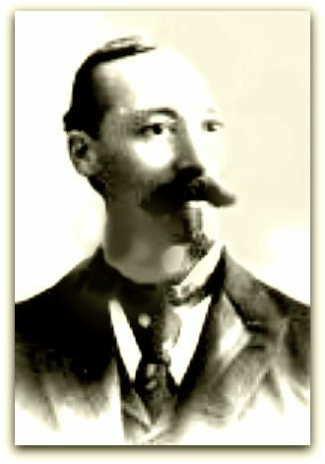 Mayor Johnson was a druggist, having established Johnson's Drug Store which carried his name long after he had retired. He was born in 1852, became mayor at the age of 53. 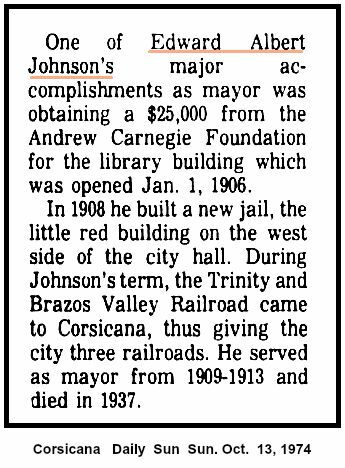 Among his accomplishments as mayor, he got $25,000 from the Andrew Carnegie Foundation for the library building which was opened Jan. 1, 1906. To maintain the library he put a 5 cent tax on each $100.00 evaluation of property. This tax still exists and helps pay a large part of the operating cost. 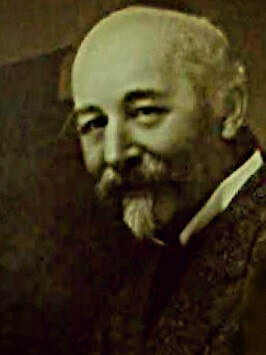 In 1905 he proposed and got the voters to approve a new city charter. In 1908 he built a new jail, which is the little red building on the west side of the city hall. During his term of office, the Trinity & Brazos Valley Railroad came to Corsicana, thus giving the city three railroads. He lived at 648 West Fifth Avenue and died in 1937. Native of England, Long Active in Civic Work, to Be Buried Saturday - Corsicana, Texas, Jan. 29. - Dr. E. A. Johnson, 84, pioneer businessman and an outstanding leader in I.O.O.F. Lodge circles of Texas for many years, died at his home early Friday. Funeral services will be held at St. John's Episcopal Church of which Dr. Johnson had been a longtime member. 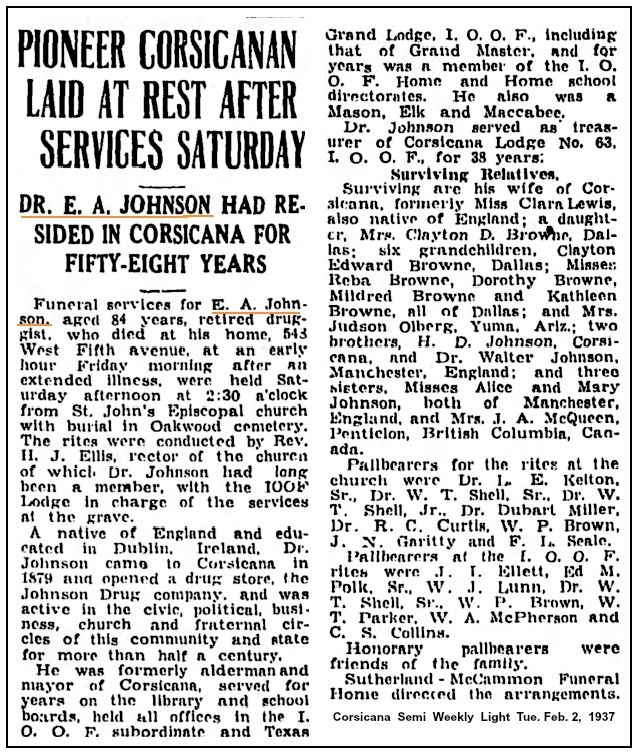 Surviving are his wife; one daughter, Mrs. Clayton D. Browne of Dallas; six grandchildren; two brothers, H. D. Johnson of Corsicana and Dr. Walter Johnson of Manchester, England, and three sisters, Misses Mary and Alice Johnson of Manchester, England, and Mrs. J. A. McQueen of Penticlon, British Columbia. Dr. Johnson was born in England and lived at Cape of Good Hope, South Africa, and Dublin, Ireland, before moving to Corsicana in 1879. He was a member of the Board of Aldermen for eight or ten years and was Mayor for four years. During his term as Mayor the public library was constructed. He served long terms of the school and library boards. Soon after the founding of the I.O.O.F. Widows and Orphans' Home here in 1880s, Dr. Johnson became affiliated with that order in Corsicana Lodge No. 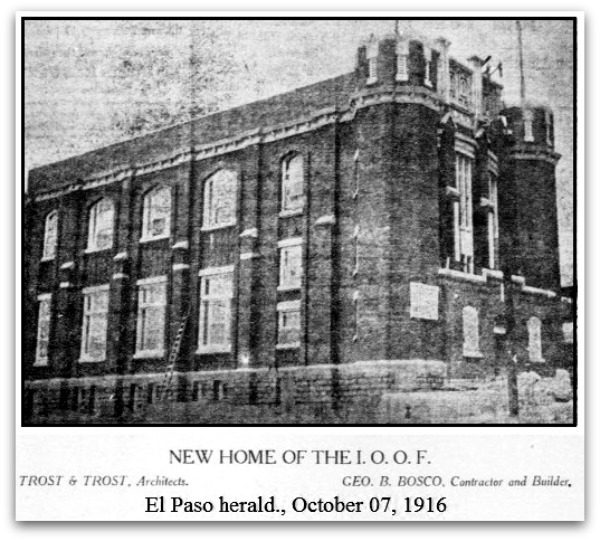 63, as well as in all capacities of the Texas Grand Lodge, I.O.O.F. He was grand master of the grand lodge, I.O.O.F., and also served for years on the home board, as well as a long tenure as chairman of the home school board. He was treasurer of the local subordinate lodge for thirty-eight years. Located at Oakwood Cemetery in Corsicana, Texas.